Journal Journey and Joy! : My friend holds Free supermarket in Saitama. My friend Taiki Ikeda who appeared on my TV holds a new event. In the free supermarket, you can get goods which will be wasted some reason for free. The other day free supermarket was held in Tama Tokyo. This one will be the second time in Japan. CAWAZ is an organisation which works to motivate every individual. They hold the free supermarket to make the society which anyone can eat foods enough at least. 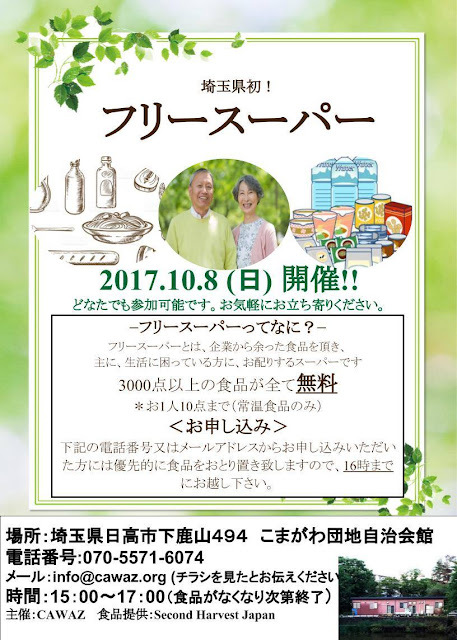 From Second harvest Japan which is the biggest food bank in Japan offer 100-150 peoples foods. Second Harvest Japan is NPO known as they distribute food to the poor or people who are hard to get food. ・You can bring back to home up to 10 things. ・We don't prepare plastic bags for saving the environment. Please bring bags by yourself. ・In this time free supermarket, we offer the foods that can be stored room temperature. １５：００〜 Close when the food runs out. ※If you find any problem with the food, please contact us not the production company. I credit the company which offers foods for them. At first, a food company should reduce the waste, then if the company still has a rest. I know that donating foods don't make money but someone needs it. When I was in U.S two years ago, the Churches or local community offers free supper for everyone few times a week. I don't know this kind of offer in Japan. We also need like this.